Both of them are two different ways of cooking. Both of them used for cooking but which one you will choose depends on what you are going to cook. Generally, the most common food product which use bake cooking way is bread and which use broil cooking way is Meat. The secret behind these both methods of cooking something is dry heat. Heat used in baking is slightly different from heat used in broiling. Bake and broil both methods are interchangeable, but they are similar and several foods can be cooked by using any of these methods. Most oven come with a broiler beneath oven and an oven for baking. Summary: Difference Between Bake and Broil is that bake cook food by giving heat from all the sides and broil gives heat to the food from the above. Baking use more time than broiling. Baking cook your foods from all the sides unlike Broiling which cook your foods from the above. In Baking, heat is distributed equally to all sides of the foods but in broiling most of the heat oven gave to the upper part of the food. Baking use indirect heating while broiling use direct heating. Broiling use higher temperature than baking, so the food cooked instantly by broiling as compared to baking it. Food cooked by broiling it, the upper part of the food will be more crispy. And the food cooked by baking it, whole food remains same. While broiling your food, it expose your food to direct heat. Or you can say that broiling works the same way how grilling works. 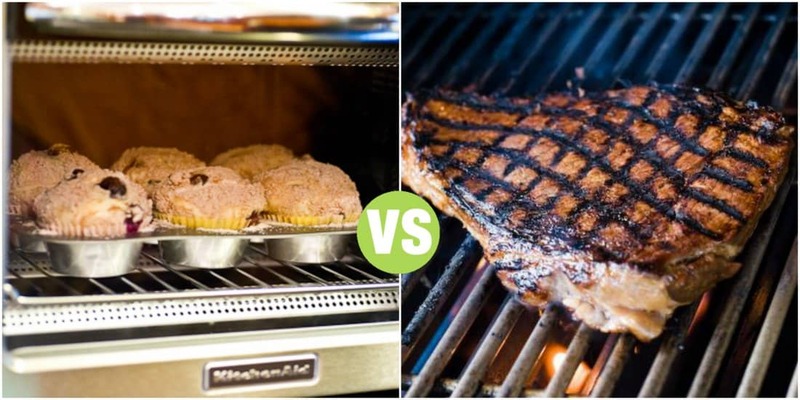 What the difference between grilling and broiling is that in grilling food get heats from the below and in broiling food gets heat from the above. When broiling your food, place your food in a broiling pan which is placed inside your oven’s broiler. And then close the door of your broiler so that your food can get heat from above to the below. Broiler’s use 550˚ degrees F (288˚ C) temperature for cooking, this much temperature instantly burns directly the outer part of the food. E.g you are going to broil a 1 inch thick beef steak, it will only take 3 minutes on each side of your steak to be broiled up. When baking your food, your food gets cooked by the oven’s hot air. While baking, you can’t put the food directly on your oven’s rack, you have to put your food on baking pan or baking sheet. The temperature of baking oven generally use 170˚-500˚ degrees F to bake the food, which depends on the settings of your oven. Baking use more time than broiling. Baking cook your foods from all the sides. Both of the methods use dry heat which suits the foods that are moist. Foods that are not very thick, broiling goes superb with them because it quickly burns the upper part of the food. Thinner beef cuts, thighs, chicken wings and boneless chicken breasts, legs cooked perfect by using broiling method. Because they are not much thick as compared to fish, pork tenderloin and bone-in variety. You can also cook different vegetables and fruits well by broiling them. And when making cakes, breads, cookies and other bread items or desserts, baking is BEST because it cooks slowly. You can also bake many foods which you can broil too, the difference is that baking will take more time than broiling.